The Pueblo Symphony will present their opening season concert of the 2018-2019 concert season on Sunday, October 14, with a program called Standards of Love. Featured guest artist is Sal Viviano. A Detroit native, Sal Viviano began his career opening for Comedy Greats of the last generation and in Showrooms throughout the Midwest. After completing his degrees from Eastern Illinois University, he taught high school while earning his Union cards as an actor in Chicago. Sal made his Broadway debut in The Three Musketeers in 1984. The New York Times recently called Sal Viviano "... a luxuriant vocalist with effortless style ... ". He since has played co-starring roles in many Broadway hits. Viviano has numerous film credits and television appearances. He has sung well over 300 concerts with 200 symphony orchestras around the world, many for several return engagements, including his return to Pueblo for this concert. Mr. Viviano has also appeared in-concert with orchestras and big bands at more intimate venues including The White House, The Inaugural Concert, and Carnegie Hall. Sal has made over 70 recordings including his most recent CD entitled Perfectly Frank - A Century of Sinatra. He is a proud long-time member of the legendary Friar&apos;s Club and annually participates in many notable fundraising events for deserving charities. Sal resides in New York City and Culver City, CA, with his wife, the extraordinary actress Liz Larsen and their boys, Alessandro Gian and Joseph Dante. Single tickets ($35.00) for this concert are available at the Sangre de Cristo Arts and Conference Center Box Office. For tickets, please contact the Arts Center, 719-295-7200. A special student rate for tickets is available just prior to the performance at the concert hall for $5.00, per student. Mr. Viviano and the Pueblo Symphony will present an Outreach Concert on Friday, October 12, 2018, in the auditorium of Pueblo West High School, 661 West Capistrano Avenue, Pueblo West, Colorado, at 7 PM. The cost for this concert is $10 for adults, $5 for students and is general admission only, payable at the door. The Pueblo Symphony will present their second season concert of the 2018-2019 season on Saturday, November 10, with a program called Autumn Strings. Featured guest artist is Linda Wang, violin. Since her debut with Zubin Mehta and the New York Philharmonic at the age of nine, Linda Wang has performed concerti with over seventy five orchestras nationally and internationally in collaboration with such eminent conductors as Sir Georg Solti, Jorge Mester, and JoAnn Falletta. An avid recitalist and chamber musician, she has performed to critical acclaim at such prestigious venues as Carnegie Hall, Amsterdam&apos;s Beurs van Berlage and the Berlin Schauspielhaus. A devoted pedagogue, Linda is the String Chair and Professor of Violin at the University of Denver&apos;s Lamont School of Music, and also the recipient of DU&apos;s Teacher-Scholar of the Year Award. She maintains a worldwide presence as a performer and educator, and is a faculty artist at international music festivals and an adjudicator and master class clinician_ She performs on a 1767 J. B. Guadagnini violin. She will perform Antonin Dvorak&apos;s Violin Concerto in A minor, Op. 54 (B.108). Also on the program will be Rossini &apos;s Overture to Semiramide and Hindemith&apos;s Symphonic Metamorphosis. Single tickets ($35.00) for this concert are available at the Sangre de Cristo Arts and Conference Center Box Office. For tickets, please contact the Arts Center, 719-295-7200. A special student rate for tickets is available just prior to the performance at the concert hall for $5.00, per student On Friday, November 9, at 12 Noon, the PS Friends will present a Guest Artist&apos;s Luncheon at the Pueblo Country Club. Ms. Wang will perform at the luncheon and will be accompanied by Dr. Zahari Metchkov. Cost of the luncheon is $20 per person and reservations can be made by calling the Symphony office: 719-545-7967. The Pueblo Symphony will present their third season concert of the 2018-2019 season on Sunday, December 9, with a program called Feliz Navidad. Featured guest artists will be the Los Romeros Guitar Quartet. 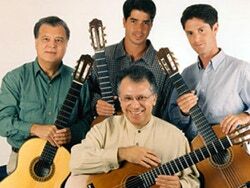 Over half a century after walking onto the world stage as the first classical guitar quartet, Los Romeros continues to be a veritable institution in the world of classical music, dazzling countless audiences and winning the raves of reviewers worldwide. Known to millions as The Royal Family of the Guitar, because their personnel consists entirely of members of the Romero family, The Romeros were founded by the legendary Celedonio Romero, who grew up in Franco’s Spain, with his sons Celin, Pepe and Angel in 1958. All three of his sons had made their performing debuts before they were seven years of age. The Quartet went through natural transformations, and today consists of the second (Celin and Pepe) and third generations (Lito and Celino). To have so many virtuoisi of the same instrument in one family is unique in the world of musical performance, and in the realm of the classical guitar, it is absolutely without precedent. They will perform the Concierto Andaluz, a 1967 work by Spanish composer, Joaquin Rodrigo, for four guitars and orchestra. It was commissioned by Celedonio Romero and first performed by Los Romeros with the San Antonio Symphony Orchestra. Los Romeros will also perform several selections from their Christmas CD with the Pueblo Symphony. As an added treat for attendees, the Pueblo Symphony will perform selections from Tchaikovsky’s The Nutcracker with the Sangre de Cristo Arts Center Ballet. The Pueblo Youth Symphony will entertain with holiday selections at intermission. Single tickets ($35.00) for this concert are available at the Sangre de Cristo Arts and Conference Center Box Office. For tickets, please contact the Arts Center, 719-295-7200. A special student rate for tickets is available just prior to the performance at the concert hall for $5.00, per student. The Pueblo Symphony will present their fourth season concert of the 2018-2019 season on Saturday, February 2, with a program called Heart Strings. Featured guest artist is Wei-Wei Le, (Way Way Le), violin. Quoted by legendary violinist, Sir Yehudi Menuhin, “Wei-Wei is one of the most talented young musicians I have ever seen.” Wei-Wei Le is a native of Shanghai and began her violin studies at the age of six. Ms. Le has won numerous international violin competitions including the Yehudi Menuhin International Violin Competition in England, the Kloster Schontal International Violin Competition in Germany, and the Starling International Violin Competition in the United States. She also has been awarded many important awards for her artistry from the Chinese government, and was listed in the Who’s Who in China. As a solo performer, Ms. Le has given recitals and concerts all over the world and has been featured in leading music stages such as Carnegie Hall, Barbican Center, Wigmore Hall, Royal Festival Hall, and Davies Symphony Hall. She has performed with noteworthy orchestras such as the Hong Kong Philharmonic in Hong Kong, Royal Philharmonic Orchestra in London, Queensland Symphony in Australia, Hunan Symphony Orchestra and the Tiajiin Symphony Orchestra in China. She was featured many times as a soloist to perform for Queen Elizabeth II of England and her royal family in Buckingham Palace. Wei- Wei currently resides in Las Vegas, NV. She is an Assistant Professor in Violin at the University of Nevada, Las Vegas. She will perform Niccolo Paganini’s Violin Concerto #4, MS 60. Also on the program will be Khachaturian’s Spartacus Suite #2 and Ravel’s La Valse. Single tickets ($35.00) for this concert are available at the Sangre de Cristo Arts and Conference Center Box Office. For tickets, please contact the Arts Center, 719-295-7200. A special student rate for tickets is available just prior to the performance at the concert hall for $5.00, per student. On Friday, February 1, at 12 Noon, the PS Friends will present a Guest Artist’s Luncheon at Table 67 on the Riverwalk. Ms. Le will perform at the luncheon and will be accompanied by Dr. Zahari Metchkov. Cost of the luncheon is $20 per person and reservations can be made by calling the Symphony office: 719-545-7967. The Pueblo Symphony will present their fifth season concert of the 2018-2019 concert season on Saturday, March 9, with a presentation of Verdi’s Requiem. The concert will feature four soloists and three choirs. Dr. Jacob Chi will conduct. The concert begins at 7:3pm in Hoag Recital Hall on the campus of Colorado State University–Pueblo. 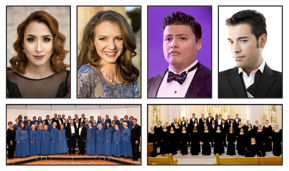 The three choirs that will be featured are The Pueblo Choral Society, the CSU-Pueblo Concert Choir, and the CSU-Pueblo Chamber Choir. The four vocalists are Carla Portillo, Clea Huston, Efrain Corralejo, and Salvador Rivas. The Pueblo Choral Society was organized in 1986 under the direction of Dr. Dana Ihm. It is a premiere choral group capable of doing an extensive repertoire of choral music which will please any audience. The CSU-Pueblo Concert and Chamber Choirs are under the direction of Dr. Dana Ihm. They have performed in very prestigious venues in the United States and Europe including Notre Dame Cathedral, the Vatican, and Vienna. Carla Portillo, soprano, graduated from the Arts Faculty of Universidad Autonoma de Chihuahua. She began her training at the Chihuahua Conservatory and started her career as a leading soprano with orchestras in Mexico and the US. Clea Huston, soprano, has performed diverse symphonic concerts from early music art songs to opera pops. Her Doctorate in Opera and Vocal Pedagogy is from the University of Colorado at Boulder and her Masters and Undergraduate degrees are from the New England Conservatory of Music. Efrain Corralejo, tenor, was born in 1992 in Leon, Guanajuato. Efrain graduated from the Superior School of Music of the National Institute of Fine Arts at the CDMS. He is currently studying the specialty of LIED. Salvador Rivas, Bass – Baritone, began his music studies at Luigi Cherubini Conservatory in Florence, Italy. He was awarded the Placido Domingo scholarship to continue his training at SIVAM. He also received a scholarship from the Juilliard School of Music. He attended the Lyric Opera Studio in Weimar, Germany. Single tickets ($35.00) for this concert are available at the Sangre de Cristo Arts and Conference Center Box Office. For tickets, please contact the Arts Center, 719-295-7200. A special student rate for tickets is available just prior to the performance at the concert hall for $5.00, per student. PS Friends will present a Guest Artist’s Meet & Greet on Friday, March 8, 2019, from 5 – 7 PM, at the Pueblo Country Club, 3200 8th Avenue. Cost of the Meet & Greet is $20 per person and reservations are required by calling the Pueblo Symphony office at 719-545-7967. The four guest soloists will perform at the event. The Pueblo Symphony will present their final season concert of the 2018-2019 concert season on Sunday, April 28, with a program called, “Rach and Roll”, featuring Dr. Zahari Metchkov, piano. Dr. Jacob Chi will conduct. The concert begins at 2:30 PM in Hoag Recital Hall on the campus of Colorado State University – Pueblo. Dr. Zahari Metchkov is both a pianist and an organist. He has performed at such venues as New York’s Avery Fisher Hall and Washington’s Kennedy Center. He has concertized in Israel, Bulgaria, and the United States. A native of Sofia, Bulgaria, Dr. Metchkov holds a BM in Piano and Organ Performance, a MM in Piano Performance, and a DMA in Piano Performance with a minor in Music Theory from the Cleveland Institute of Music, Cleveland, Ohio. 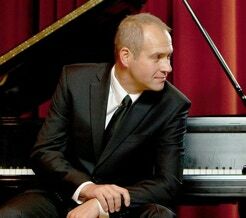 In the fall of 2010, he joined the CSU-Pueblo Music Department in the capacity of Assistant Professor of Music, teaching applied piano, piano-related courses, as well as theory. Dr. Metchkov will be featured in Piano Concerto No. 2 in C minor, Op.18 by Sergei Rachmaninoff. The Pueblo Symphony Orchestra will be featured in The Rite of Spring by Russian composer, Igor Stravinsky. Single tickets ($35.00) for this concert are available at the Sangre de Cristo Arts and Conference Center Box Office. For tickets, please contact the Arts Center, 719-295-7200. A special student rate for tickets is available just prior to the performance at the concert hall for $5.00, per student. PS Friends will present a Guest Artists’ Luncheon on Friday, April 26, 2019, at 12 Noon at the Pueblo Country Club, 3200 8th Avenue. Cost of the luncheon is $20 per person and reservations are required by calling the Pueblo Symphony office at 719-545-7967. Dr. Metchkov will perform at the luncheon.